A Fourier-based Review of Beech and Knapweed. in Science Forum, issue 7, Autumn 1987, page 4. 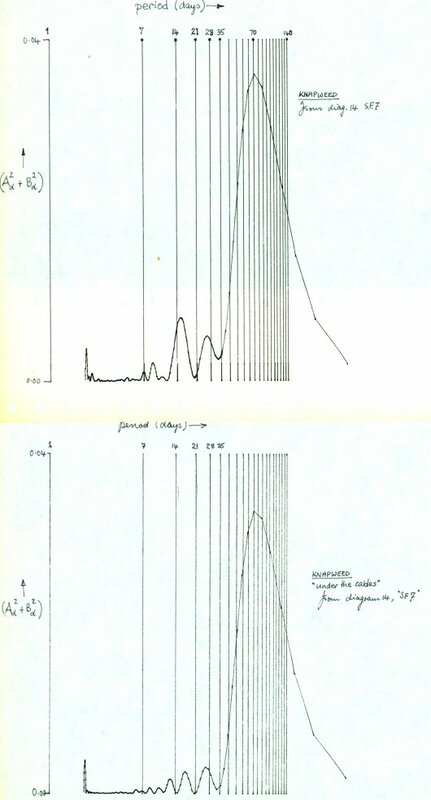 The Fourier Power Spectra below correspond to the λ-variation, assessed and graphed, as shown on the left, by Mr Edwards, of a Beech bud in Strontian on the West coast of Scotland. The data span 1984-1985, and the spectra from the two years overlay each other. A distinct peak occurs in both years at the Fourier order corresponding to just more than 14 days - that is, very nearly at half the lunar orbital period. So this bud was quite detectably changing its form in the rhythm of the Saturn/Moon alignment. 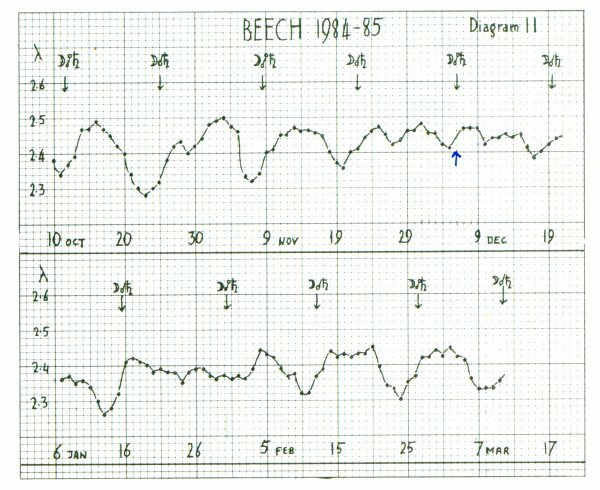 There is also just a hint of weekly rhythm. Other peaks immediately flanking this main peak, in both years, are probably ‘side-bands’ representing amplitude modulation of the λ “signal”. 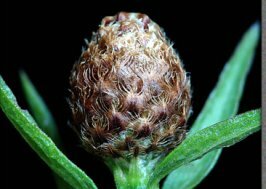 There is also a long “swell” of form-change peaking around 90 days, or 3 months, which might simply represent the bud's passage from Autumn through Winter to Spring. by Fourier synthesis up to component-order 25 (bold trace). The “Basal λ”, synthesised to just order 3, indicates the underlying form trend. These Knapweed plots are especially interesting, as they derive from two sets of Knapweed flowers, which grew at the same time on a hillside in Strontian. One set grew directly under high-tension, probably 11 KV, power cables. The other set grew out in the open, well clear of the cables. 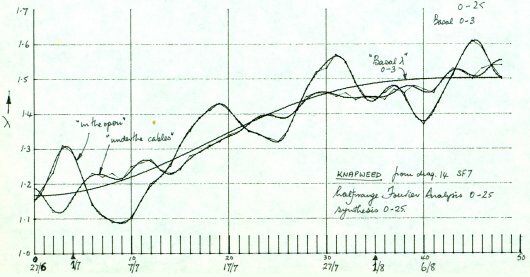 On the other hand, the λ-graph for the Knapweeds under-the-cables shows essentially no 14-day λ-rhythm, and this is confirmed beyond doubt by the corresponding Fourier spectrum, shown on the right, below the other: the λ-signal for this 14-day period is close to nil, while the other spectral features appear to be almost the same as they are in the upper, in-the-open spectrum. It seems probable that the electromagnetic (EM) field under the cables is in some way responsible for the attenuation, but it is also possible that the cables merely screen the flowers fom the Heavens, in the sense that they may do this whether or not the cables are live, and whether or not there is an EM field there. This all cries out for serious, further investigation. We may have an electrical effect on living form. Do EM fields mediate planets and plants? A whole chapter of research is here. We could, for example, sling cables over hedgerows of buds, and control the strength and frequency of the EM fields they produce, then monitor the effect on the form of the hedge buds, and on the relationship of that form to alignments. We could monitor atmospheric charge using a field mill.